How did it come to pass that I had never read George Orwell’s 1984? Certainly I have very clear recollections of there being a copy in my parents’ book collection, with the proper, spelled-out numbers and everything. I’ve always been a voracious reader, and yet somehow 1984 escaped me. When I ran a poll asking which “classic” I should read for #30before30, 1984 streaked ahead, winning 29 out of 73 votes, ahead of Aldous Huxley’s Brave New World on 19, and Catcher in the Rye on 14. The thing I noticed most as I threw myself into Orwell’s … well, Orwellian vision of the future is just how familiar it was, even though I hadn’t actually read his words before. Turns out everything dystopian since 1984 really IS derivative. Not that that’s a bad thing. It’s a great playground that Orwell built that others now delight in running around in. For other literary ignoramuses, a brief rundown: in 1984, the world is divided into three superstates, in a constant state of war. Oceania is ruled by the Party; represented by the powerful figure of Big Brother. Winston Smith, a mid-level Outer Party bureaucrat, knows there must be more to life and history than hate and surveillance. He starts a rebellion, first with a diary, then a love affair, then a bold step to find and join an opposition. Then, as you might expect, it all goes terribly wrong. I don’t think I’m giving anything away by saying that, am I? It’s not like anyone was expecting fairy floss and kittens. Winston is the epitome of the reluctant hero, beaten down physically by life under an oppressive totalitarian regime, but still sharp enough upstairs to question the established wisdom, and commit thoughtcrime. His growing confidence in his own sanity, and conviction that all around him is madness, gave me hope that he might survive, even though he kept repeating that his fate would be vaporisation; death. I loved the technology in the book, which was written in 1948. The telescreen, a two-way TV installed in virtually every room, was Orwell’s forecasting of webcams and even GPS in a way. Of course, using today’s technology, Winston and Julia’s illicit affair would’ve been busted a lot sooner. It’s no wonder modern authors continue to develop the genre as technology evolves – Ben Elton’s Blind Faith (about a future where everyone watches each other through social media) is a recent example. I was quite upset by the detestable attitude of Party members to the “proles”, the great unwashed masses who are seen as little more than savages. I must admit to finding it very creepy that there were whole departments dedicated to mass producing crappy songs and books for their “entertainment”. Any number of current TV programs and pop culture totems could fit that bill. Possibly the most fascinating character is O’Brien, the man who first seems like he could be an ally, but is in fact a Party strongman and brainwasher-in-chief. He has that sane kind of madness that is more frightening than any ranting lunatic. The brainwashing of Winston Smith is carried out with clinical detachment; yet O’Brien almost seems to bear a grudging respect for Winston. One gets the feeling that he doesn’t elucidate so much about the Party’s methods to every victim. Winston’s eventual submission is tragic, if not unexpected. I was saddened at his metaphorical “execution” – ie, the ultimate surrender to Big Brother worship. But part of me hoped that maybe those little flashbacks he tried so hard to stop might come back. I found Newspeak as a linguistic construct brilliantly imagined. I discovered that the appendix at the end of the book is somewhat controversial; some say it’s just an explanation, others maintain its past tense indicates it was written in a post-Party future. I’m not sure what it says about me, but I chose to believe in the latter point of view. That Winston was not the last free thinker, that perhaps the Proles did rise up as he theorised they might, but something DID happen, and the world of 1984 was overturned. Orwell wrote the book in the years after World War Two, when the Nazi regime was finished, but the Soviet one was growing stronger. He meant it as a warning to democracies to remain vigilant against totalitarian tendencies. In a post-September 11, Patriot Act, Guantanamo Bay kind of world, it’s still a warning we can heed. Gotta admit, I haven't read it either. On the list. Cheers. Marvellous review, I enjoy reading the impressions people who I like have on books that I read and enjoyed. I read it in my teens and so I probably missed a lot of the subtleties so its like I get to enjoy it all over again when a pair of fresh eyes reads the story. "If you want a picture of the future, imagine a boot stamping on a human face—forever." Can't wait for your next classic reading. I always read Brave New World after reading 1984 as a two for one dystopic mind warp. I've read it three times. I don't need to read it again to know I'm living through more and more of it... but in truth, Brave New World is closer to reality. Neither of them is much fun. On the other hand, what's so much fun about the reality we've built? Hey guys - thanks for your comments. It's getting a bit dry over here in 30before30 world. I do plan to read Brave New World at some point as it was second in the poll. 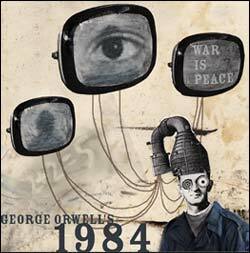 I guess you can't say 1984 is "fun"... but it was really engrossing. Is that a KIND of fun? Yeah, I love that boot line. I was just waiting for that. Glad others view the appendix as hopeful! Hey GC, just discovered your blog, loving it. Funnily enough I read both nineteen eightyfour and Brave New World within weeks of each other many years back after deciding I needed to find out if all these books people raved on about were worth the hype (they were!!). But if you enjoyed 1984 then you must watch Terry Gilliam's movie 'Brazil', to this day the only movie to get an Oscar without actually being released at the time (THERE'S a story!!). Very much based on the book, but a great Gilliamesque twist (I get the feeling that if you're not a fan of his already you would certainly enjoy his work), won't give anything away. Loving your blog anyway, will keep an eye on it. Hope you didn't get washed away by the floods! !